Prof. Henrique M. Oliveira, from IST (Mathematics Department) and CAMSD, will give the next GoLP VIP Seminar on October 8, 4.30pm in Anfiteatro Abreu Faro (Complexo Interdisciplinar). The seminar will focus on the mathematical modelling of the synchronization of two pendulum clocks, a phenomenon first observed by Huygens during the XVII century. 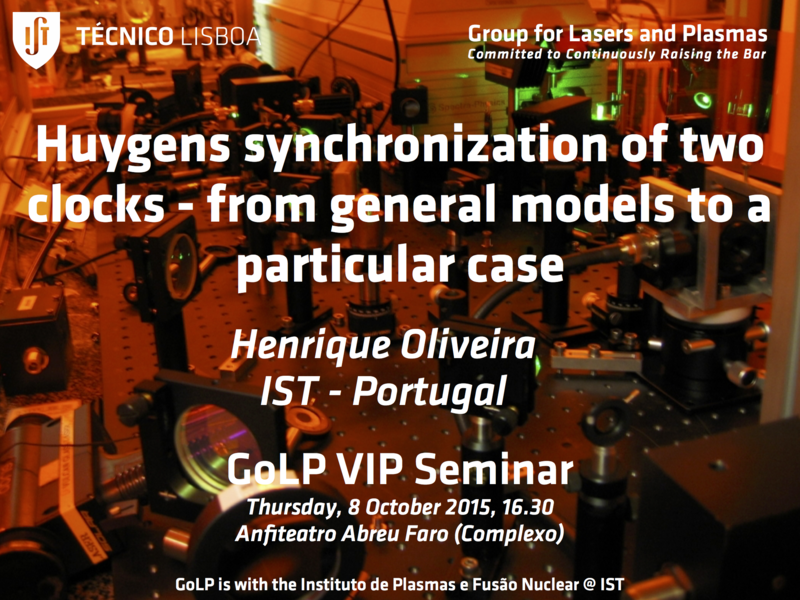 The model presented in this seminar was verified experimentally in a work featured on the last GoLP VIP Seminar. 1. An overview of the methods available for the study of synchronization of dynamical systems modelling actual phenomena. 2. The mathematical model used to explain the observation by Huygens 350 years ago and our experiment results. 3. How the simulations were carried on and the simplifications used. 4. Extensions and future work, namely: Arnold tongues and the theory of coupling by constant impacts between electronic oscillators.